Not much new to report from hospital land. My hip and the incision site ache and burn. My right leg basically does not work – it is incredibly heavy and like a dead muscular fish. Therefore, my left leg is having to bear the burden of walking and pretty much any activity I try. Unfortunately the left leg quickly becomes very weak and unstable and I feel like I could easily collapse (i have a similar problem with my left leg as the right and am having surgery in May. It looks like i will be released tomorrow to recuperate at home for several months. Dressing over the incision comes off tomorrow too! For the meantime, here is an x-ray of my right hip post-PAO (the doctor takes numerous X-rays during the procedure to be sure that the placement is correct and he kindly gave me a copy). More photos coming soon! 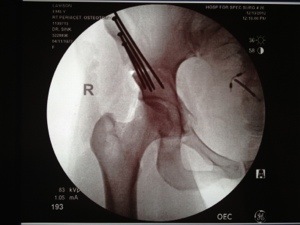 This entry was posted in Hip Dysplasia, PAO, Physical Therapy, X-Rays and tagged hips, hospital for special surgery, HSS, PAO, screws, sink, surgery on December 16, 2012 by dramaticallyhip.